The key issue in the Heller case is whether the Second Amendment of the U.S. Constitution provides an individual right to have firearms or whether that right is limited to those who are members of the “militia”, or what is, today, the National Guard. The current case started when plaintiff Richard Heller sued the District of Columbia after it rejected his application to keep a handgun in his own home for self-defense. The U.S. Circuit Court of Appeals for the D.C. District agreed with Heller, and struck down the D.C. handgun ban as unconstitutional. The District of Columbia appealed the Appellate Court’s decision to the U.S. Supreme Court. Today, lawyers for both sides presented their arguments, starting at 10:00 am Eastern Time. “JUSTICE ALITO: Your argument is that [the Second Amendment’s] purpose was to prevent the disarming of the organized militia, isn’t that correct? Lining the street in front of the Supreme Court building were scores of interested citizens. Both sides in the debate were represented. Two days ago, a line to get into the Supreme Court for the historic arguments began forming; the line extended more than a block this morning. Second Amendment supporters held signs saying “Support the Constitution” and “Guns Stop Crime”, while gun control advocates held anti-gun placards. Representing AccurateShooter.com at the hearing today was attorney (and highpower shooter) Robert Whitley. Robert is attending the hearing as an observer. He will listen to the questions posed by the members of the Supreme Court and try to discern which way the justices will lean in the case. No one can really predict how the High Court will rule in D.C. vs. Heller, though the majority of top legal scholars, including Lawrence Tribe of Harvard Law School, now favor the view that the Second Amendment confers rights to individual citizens, just like the First Amendment. The final ruling in the case is expected in June. At least one legal scholar, Prof. Nelson Lund of the George Mason Univ. Law School, predicts that the Supreme Court will invalidate the District of Columbia’s ban on handguns, but it will do so with a narrowly-drawn ruling: “Because this would be the first case in history in which the federal courts invalidated a gun control statute under the Second Amendment, the Court would probably write its opinion narrowly.” Lund notes that: “If the Supreme Court accepts D.C.’s principal contention–that civilians have no constitutional right to possess firearms except in connection with militia service–the Second Amendment will essentially become a dead letter.” The High Court, Lund believes, would be reluctant to effectively extinguish part of the Constitution. CLICK HERE for Lund’s Analysis. Robert Whitley will be filing his report by phone will us soon, so check this Daily Bulletin for updates. It may be many weeks, or even months, before the U.S. Supreme Court actually issues its ruling in this case. 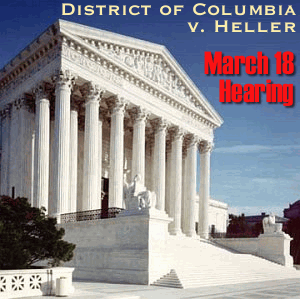 For more information on the D.C. vs. Heller case, click these links below. Share the post "Today's the Day — Supreme Court Hears Second Amendment Case"
Sinclair International recently introduced a “stretched” version of it’s popular aluminum rifle cleaning cradle. Priced at $49.85, this “long-wheelbase” 03-2600 design fits lengthy prone and Highpower stocks. This cradle is complete with legs, standard 14” tie bars, and rubber-lined saddles #CC190 (rear) and #CC120 (front) for varmint and prone rifles with large rear grips. Sinclair notes: “We recommend this cradle for stocks with forends up to 2.625” and rear grips from 1.75” to 2.35”. 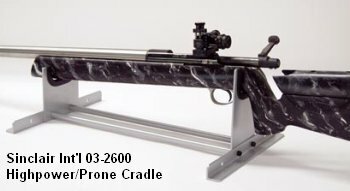 Some stocks that will fit this cradle include most Masterclass Highpower and prone stocks and some heavy varmint/target type stocks.” If you need a cradle for long-range BR and F-Class stocks with wider fore-arms, Sinclair offers cradle model 03-2400, which has a #CC130 front saddle that fits fore-arms up to 3.25″ in width. 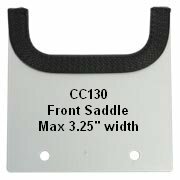 Front and rear rubber-edged stock saddles of various widths can be ordered seperately for $13.65. These can be easily swapped in and out of the basic Sinclair rifle cradle to fit different stock configuations. 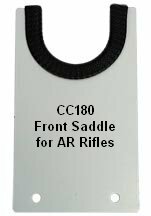 For example, the #CC180 front saddle has a curved profile to fit the round handguard or float tube on AR-style rifles. Share the post "Sinclair Int'l Introduces Ultra-Long Gun Cradle"